The Roddenberry Foundation has announced that Libraries Without Borders was named a finalist for its first Roddenberry Prize of $1 million. Libraries Without Borders was recognized among the 600 applicants from 27 countries all proposing bold solutions in the spirit and mission of the foundation. Libraries Without Borders seeks to transform the lives of tens of millions of refugees and at-risk populations throughout the world and to change the very definition of humanitarian assistance by giving these people the tools to become agents for change. We gratefully acknowledge the recognition of the Roddenberry Foundation for our shared vision of the enterprise of human betterment. Founded in 2007, Libraries Without Borders has become one of the world’s leading NGOs working to expand access to information and education to vulnerable populations around the world. We have worked extensively in Central Africa, Europe, and the Middle East, and with the support of the Roddenberry, we will expand our operations to communities in the United States. Our innovative creations include the Ideas Box, a transformative technology that tackles systemic challenges faced by vulnerable populations around the world. 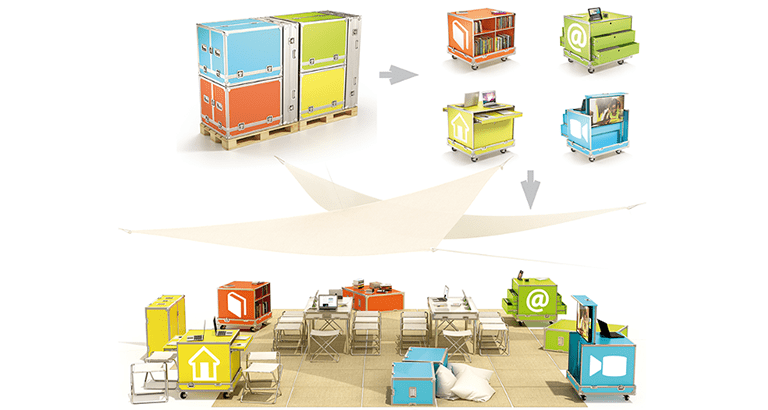 Designed by LWB in collaboration with designer Philippe Starck and the United Nations High Commission for Refugees, the Ideas Box is a standardized, portable and quickly deployed tool that becomes a library, a school, and a community center. It is a robust and energy-independent multimedia kit with internet access that provides curated content customized to meet the needs of the people, their language, and their culture. Since 2014, when we sent four prototypes of the Ideas Box to refugee camps in Burundi, we have sent ten to Syrian refugee camps in Jordan, Lebanon, Iraq, Greece and Germany. We are currently implementing new programs in Central America, North America, Europe and the Middle East. There are currently more than 100 Ideas Box projects in 17 countries and across 3 continents. Working with local partners, our Ideas Box programs give access to digital libraries, educational programs, and training platforms that enable vulnerable populations to become the architects of their own futures.